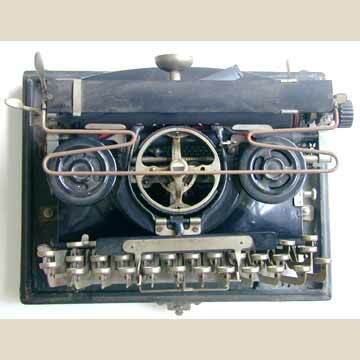 The Folding Hammond that appeared in 1923 was the last of the Hammond typewriters. Four years later the name was changed to VariTyper. The Hammond Folding was in fact a Hammond Multiplex with two type shuttles, that could be turned around for immediate use. Two buttons on either side of the keyboard unlocked the keyboard and allowed it to be turned up. In folded position, the lid of the case slid over the machine, making it easier to carry. However, the Folding Hammond was a complete office size Hammond Multiplex, so although it folded into a less clumsy package to drag around, the machine could hardly be regarded a 'portable' typewriter. 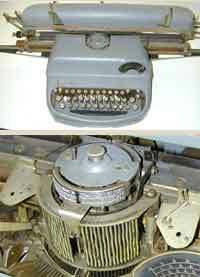 The Varityper office type setting machine does not have a separate entry in the Virtual Typewriter Museum. The pictures here however, of a 1960s Varityper, show that the mechanism of the machine remained unchanged since the Hammond Multiplex was built. Although the carriage of the machine and the hammer are now electric, the keyboard and turret are identical to those of the early Hammonds.